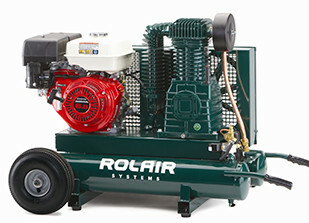 Rolair has built their reputation on providing contractors with the highest quality air compressors available. Dependable and rugged jobsite performance that our customers demand. We are proud to partner with Rolair and provide our customers with the best portable air compressors available anywhere. 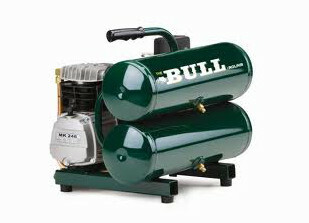 Rolair portable air compressors provide Unparalleled performance. Proven jobsite rugged dependability. Zero sick days from this crew. Don't get caught without one. Rolair VT25BIG Electric 2.5 HP wheeled Compressor with Overload Protection. Rolair 5715K17 Electric Air Compressor 9 Gallon Wheelbarrow tank 1.5HP Elec. Rolair 4090HK17 Gas Air Compressor 5.5hp Honda. 9 GAL wheelbarrow tanks. Rolair 6590HK18 Gas Air Compressor 6.5HP Honda. 9 GAL wheelbarrow tanks. Rolair 8422HK30 Gas Air Compressor 9HP Honda. 9 GAL Wheelbarrow Tanks. 1/2 HP - 2 Hp electric and 4hp gas. Convenient portable Air that goes where you go. Rolair dependability. Rolair GD4000PV5H 4Hp 4-1/2 Gal Gas-Powered Hand Carry Air Compressor Honda engine.